Highly digestible venison and small kibble size make this formula easy on your small breed dog’s tummy and teeth. Probiotics and prebiotic fiber help support healthy digestion, while roasted venison, along with lamb, egg, duck and ocean fish proteins provide optimal amino acid nutrition. Rich in protein and fat, this formula provides the energy that active small dogs need. Pasture-Raised Venison – Venison, the number one ingredient in this formula, is rich in nutrients and energy, and a highly digestible source of protein. Ideal For Small Breeds – Rich in proteins and fat, this formula provides the energy that active small breed adult dogs need in a small kibble size that is easy for small mouths to chew. Species-Specific Probiotics – Healthy digestive and immune systems are vital to the overall health of your pet. Our proprietary K9 Strain Probiotics are developed specifically for dogs and added after the cooking process to ensure viability. Each pound of Taste of the Wild provides 80 million live, active cultures that help support healthy digestive and immune systems. Digestive Support – Fiber from garbanzo beans helps promote digestive health while prebiotic fiber from dried chicory root provides fuel for the beneficial probiotic bacteria in the digestive system. Antioxidants – Legumes and fruits, including peas, lentils, tomatoes, blueberries and raspberries, provide nutrients that help support your dog’s overall well-being while guaranteed levels of zinc, selenium and vitamin E support the immune system. Venison, lamb meal, garbanzo beans, peas, lentils, pea protein, canola oil, egg product, duck meal, pea flour, tomato pomace, natural flavor, ocean fish meal, salt, choline chloride, taurine, dried chicory root, tomatoes, blueberries, raspberries, yucca schidigera extract, dried Lactobacillus plantarum fermentation product, dried Bacillus subtilis fermentation product, dried Lactobacillus acidophilus fermentation product, dried Enterococcus faecium fermentation product, dried Bifidobacterium animalis fermentation product, vitamin E supplement, iron proteinate, zinc proteinate, copper proteinate, ferrous sulfate, zinc sulfate, copper sulfate, potassium iodide, thiamine mononitrate (vitamin B1), manganese proteinate, manganous oxide, ascorbic acid, vitamin A supplement, biotin, niacin, calcium pantothenate, manganese sulfate, sodium selenite, pyridoxine hydrochloride (vitamin B6), vitamin B12 supplement, riboflavin (vitamin B2), vitamin D supplement, folic acid. Some dogs may require more or less food than the guidelines depending on activity level and other factors. 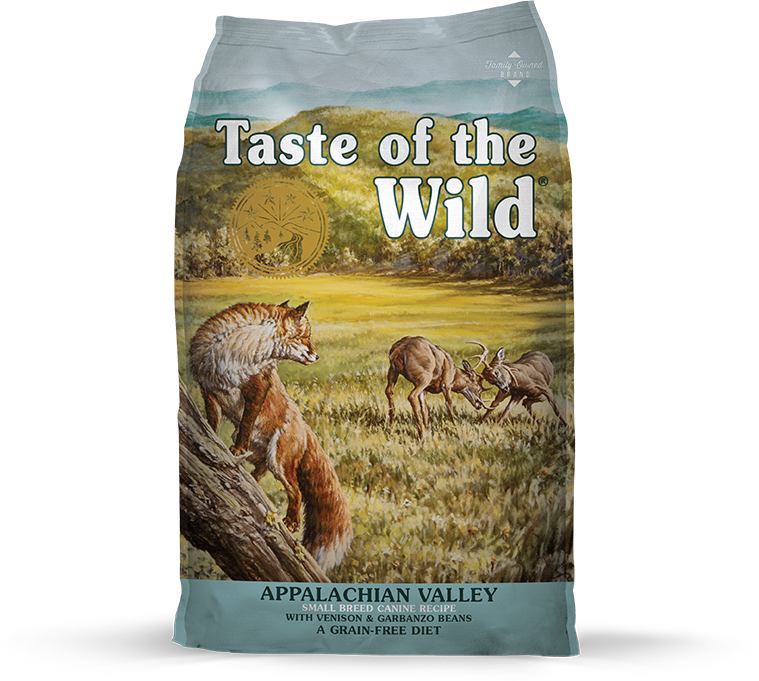 Taste of the Wild Appalachian Valley Small Breed Canine Recipe is formulated to meet the nutritional levels established by the AAFCO Dog Food Nutrient Profiles for maintenance. Appalachian Valley™ Small Breed Canine Formula with Venison & Garbanzo Beans is rated 4.8 out of 5 by 29. Rated 5 out of 5 by Virginia905 from Our picky eater Roxy loves it!! Our dog Roxy is a picky pup. We rescued her in December 2016. She was diagnosed with Lyme shortly after and her appetite was up and down. She would show some interest in other brands of kibble but would lose interest quick. We had to put her on a bland diet a few times and each time we gradually introduced a new kibble. We tried out the Taste of the Wild, Appalachian valley and she loves it! She chows it right down. This is the longest she has shown interest in food since we’ve had her. We are more than happy with Taste of the Wild pet food. I wouldn’t choose any other dog food. Rated 5 out of 5 by Alyssa from New Flavor, Happy Dogs This is the first time we have added this flavor to the dog food mix, and the dogs LOVE it. This flavor was an INSTANT hit. We have a base recipe, then we mix in a second, different recipe, to mix it up a little (see below). We have tried at least half of the formulas available at our Local Tractor Supply, and some where liked better than others. In a bucket, we mix a 15-lbs bag of TOTW High Prairie with Roasted Bison & Roasted Venison (in the yellow bag), and 2 (two) 5-lbs bags of other TOTW flavors. I don't like to eat the same food/flavor twice a day, every day, for weeks on end, so we try to add the variety for the dogs too. Rated 5 out of 5 by AJBJ from My Yorkie and Cockapoo Love this My two dogs have been eating this for over a year now after the manufacturer of their previous brand went out of business. They are thriving well, their coats look great, and they digest it well. At 2 and 3 years of age, they will stay on this brand forever. Rated 5 out of 5 by Donna50 from My Chi loves this food!!!! She has been eating Taste of the Wild venison for a year and loves it. The first picture is how excited she gets when I get the bag out to feed her. Rated 5 out of 5 by eric from My teckels love this very happy with this product line ! The best dog's food for me ! Rated 5 out of 5 by maxbeagleing from Our Beagle's Choice We've been feeding our beagle Appalachian Valley™ Small Breed Canine Formula with Venison & Garbanzo Beans from the day our beagle joined our family. His former home raised him on the formula, and now at 16 months old he still runs with excitement to his bowl at meal time. High marks for the Pine Forest® Canine Formula with Venison & Legumes formula, as well. Beagle approved! Rated 5 out of 5 by Waffles from Nom Nom Nom We recently switched from TOTW Pacific Stream to Appalachian Valley Small Breed... Mr. Waffles loves it! Easier for his little mouth to chew, he gets even MORE excited for meal time now! Rated 5 out of 5 by DarnellB from amazing food We have an 8 lb maltese who only has 4 teeth (her canines). This is the only food she enjoys and can eat without any issues to her gums, or stomach. The kibbles are the perfect size for her, and the blend of food makes her hair soft and shiny. Can you help me with how to do the transition from our current dog food to Taste of the wild Appalachian small breed? Thank you so much! Hi, Bonnie. We recommend a gradual transition between formulas over a period of 7 to 10 days. This is in case your pet has a sensitive stomach. You can do this by starting with 25% of the recommended feeding portion of the Appalachian Valley formula mixed with 75% of the recommended portion of the current formula for 2-3 days, then 50% of each for 2-3 days, and then 75% of the Appalachian Valley formula with 25% of the current formula for 2-3 days before feeding just the Appalachian Valley formula food. We're thinking of switching our dog to your food. I see you have the Small Breed formula. However I was wondering if you have a Small Breed formula for Seniors (dog 8+)? Jen2016, Appalachian Valley Small Breed Formula is a maintenance diet appropriate for an older dog. Can you give salt content? I have a dog with a heart murmur and needs low sodium food. Or would any of your dry dog foods qualify as low sodium? The sodium content of Appalachian Valley is 0.40% as fed. Several of our other formulas have lower sodium content than this one, however, we do not have any sodium-restricted diets. Can I give this specific formula (small breed) to my 2.5lb maltese 12 week old puppy? Even tho this is not stated to be for puppies. Hi, Nikki. The Appalachian Valley Small Breed Canine Formula is a great choice after your Maltese is 10-12 months old. Prior to this age, we recommend either of our puppy formulas &ndash; High Prairie Puppy or Pacific Stream Puppy. Our puppy formulas provide excellent nutrition for puppies of all sizes and breeds, and have special features to help support optimal health and well-being for growing puppies. Plus, the kibble is smaller in size, making it easier for puppies to chew and digest. Hi Cheryl, we're so glad you're considering Taste of the Wild. To obtain a sample, please call 1-800-342-4808 or visit your local retailer. Hi jokul. The number of cups per bag varies slightly, depending on the formula. Each 15 pound bag contains approximately 68 cups. We have a 9yr old American Straffshire Terrier with real flatulence problems. Our daughter uses your SW Canyon kibbles for her dog and she does great. Can you recommend one of your dry dog formulas for our dog? Hi, Barbara. Thanks for your question. Flatulence in dogs may be associated with both dietary and non-dietary causes. Dietary causes are typically associated with the amount and type of carbohydrates and dietary fiber in a formula. Individual dogs react differently to these variables, so some dogs may have flatulence problems on a certain diet while others do not. Non-dietary causes are the result of how much air dogs swallow. For instance, dogs that tend to eat very quickly tend to ingest a lot of air with their food. We have many formulas that would be appropriate for a Staffordshire terrier; Southwest Canyon Canine Formula would be a good choice, or if your dog is becoming less active or overweight with age, you might consider Sierra Mountain Canine Formula. All of our formulas include patented probiotics to promote good digestive health. Note that when you transition between formulas, it may to take several weeks of feeding the new diet before you notice a significant decrease in the amount of flatulence. We encourage you to give one of our product specialists a call at 1-800-342-4808 so we can find out more about your American Staffordshire Terrier and help you find the right formula. How much salt (sodium) contains this food? Hi, Minnie. Our Appalachian Valley Formula contains 0.4% sodium on an as-fed basis.